Autocorrect, next word prediction, themes, emojis. Well, almost all mobile keyboards around can do all of that. Where’s the innovation? The keyboard is one of the most used mobile applications, is there one that can deliver a unique and exceptional user-experience? A disruptive and more importantly a useful technology is one that helps solve a problem or make life better and easier for its users. Mobile users are different than those searching on the desktop. Immediacy of finding information, relevance of content and ease of making a quick decision are some expectations of a user using a smartphone. Users are constantly interfacing with their mobile devices to share, socialize, consume and create content, avail services etc. Facebook and Whatsapp stand out as as the most popular apps based on user base. But the two other engageement touchpoints that see a high engagement –are Call and Keyboard. However, from the mechanical clicks to soft touch and touchscreens, the most widely used input device, the keyboard has not seen outstanding changes in the last few decades. Not many existing keyboards are recognizing the importance of the keyboard is an effective platform to build innovative consumer experiences. It was not until 2007, with the launch of Apple iPhone that the touchscreen and the soft keyboard became the preferred text input methods on mobile phones and soon enough for many other mobile devices. In the world of keyboards, users have a lot of choices. But the ones that will see more user love in the coming months and years will be the ones that have the capability to bring simplicity to content and service discoveries. Predictive and intent-based targeting mechanism to deliver relevant information to consumers on their mobile devices at that single point of intent is the game-changing disruption that is not present in most of existing keyboards available on Android or iOS. There’s still much to be seen in the new era of evolution of mobile keyboards. Keyboards are doing all kind of key things like autocorrect, themes, word prediction, multiple languages and emojis but there is hardly any competition when it comes going beyond the expected and giving mobile users the hyper-intelligent content and services discoveries that delight them in their exact moment of need. Xploree is focused on empowering the consumers to decide when they want to interact with a discovery. The entire discovery experience is user-initiated that’s based on the principle of respecting user preferences on mobile. Of all the predictions on mobile user experience and engagement, Xploree stands out as an innovative and intelligent keyboard. Xploree’s strong point is also that it allows the user to be in control, granting a more enjoyable and a satisfactory consumer experience through nonintrusive, non-interruptive, relevant content recommendations. It is perhaps for these reasons that Xploree has managed to partner with leading ecosystem players including Yahoo, Groupon, Grabon etc. and OEM majors who have pre-installed the platform on mobile devices. For instance Coolpad’s latest model Coolpad Note 3 is pre-embedded with Xploree keyboard that pivots on delivering consumer experience discovery on mobile with special attention to the privacy needs of the markets where it is shipped. Xploree keyboard allows opt-in for personalized discovery across apps and then delivers deals, services etc. by understanding the consumer expressions and intent on the device thus putting the choice in consumers’ hands. Experience useful search and discovery without exiting the app, and remain in control of the recommendations. Xploree delivers a seamless user-experience across apps including mobile search, mobile instant messaging, mobile email, mobile commerce, and mobile app stores. Strict privacy controls, opt-in, opt-out features, quick opt-outs (such as incognito mode on browsers). Understanding and delivering on user intent is the next frontier of mobile user experience and engagement. 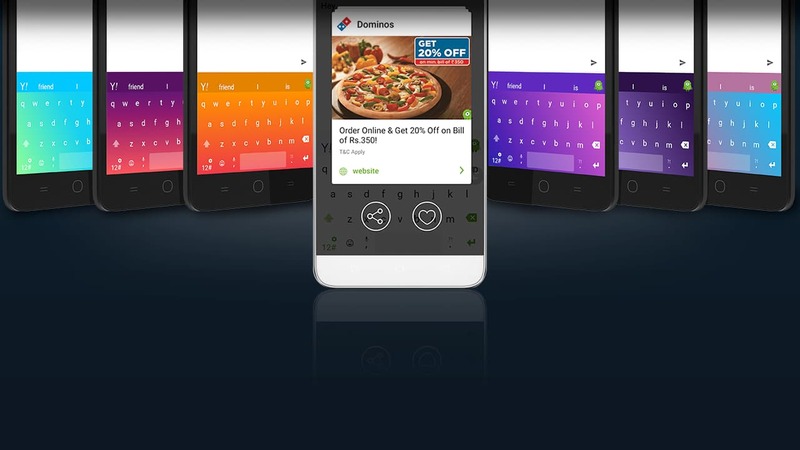 Xploree Keyboard brings in simplicity and insight to delight the users in their mobile moments whether the intent is to find a nearby pizza place in the next minute or book air tickets for this weekend. Xploree users are enjoying streamlined experiences of finding relevant content or services without leaving the app they are engaged on most. The partnerships and industry accolades for Xploree including Frost & Sullivan’s recent acknowledgement as the next generation mobile marketing is a strong acknowledgement of the transformation and evolution of mobile text input or next-generation keyboard technology. The post Innovation in Intelligence Driven Mobile Keyboards appeared first on Xploree. More than 80% mobile users search for brand promotions and coupons, Xploree addresses this demand with relevant and faster brand-user connectivity in the mobile moment. With an opportunity to provide millions of mobile users with what they need, we are now able to give our users more offers that comes with our recent partnership with GrabOn India. Through this partnership, Xploree offers GrabOn the most apt mobile platform to help online shoppers discover digital coupons and deals during their conversations on their favorite messaging apps or social platforms. Easier, faster and closest to user intent; users can discover offers and information on the go, and redeem coupons digitally or just show at the counter right from their smartphones. “We believe technology innovation is central to our commitment to offer an enhanced end users’online shopping experience,” said Ashok Reddy, Founder & CEO – GrabOn. “Partnership with game-changing mobile technology solution Xploree extends our core commitment to the mobile platform. Xploree users can access digital coupon solutions from our premium partners including Amazon, Snapdeal, Jabong, Croma, Ola, Uber, Food Panda, Flipkart, Grofers, Paytm, Yep Me, Zivame to name a few. The partnership will fuel our growth ambitions as the fastest growing coupon company in India, with over 4 million unique visitors visiting our website and over 4.3 million coupons being redeemed every month. Our current market valuation (GMV) is estimated at $80 million per year and we expect this to increase manifold through our access to smartphone users in India’s tier-1 and 2 markets,” he added. Founded in September 2013 by Mr. Ashok Reddy, GrabOn is a customer-centric online coupons and deals company which caters to the needs of all Indian shoppers. Xploree is available in India, download Xploree on Google Play.